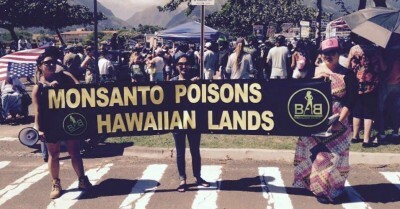 Presently, Hawai`i is used as an outdoor laboratory for companies like Monsanto to test genetically engineered crops and their related pesticides. In2013 alone there were 1124 field test sites; California only hosted 184 sites. Most of these crops are engineered to resist herbicides and pesticides. Testing these crops means repeated spraying of dangerous chemicals near neighborhoods, schools, and waterways. The initiative passed today suspends all GE operations in the county pending a safety impact review. “The moratorium will impact only 1 percent of the county’s agricultural operations, but Monsanto and Dow Chemical spent millions trying to keep residents from understanding the impacts their activities have on the community,” said Lukens. Citizen’s Against the Maui County Farming Ban – the corporate funded campaign to defeat the initiative – reported raising nearly $8 million to oppose the initiative. Dubbed the most expensive local initiative in the country byCenter for Public Integrity, this amounts to more than $290 for every “yes” vote, according to the third round of results.